Matt Overman and Matt Delgado join Donuts. 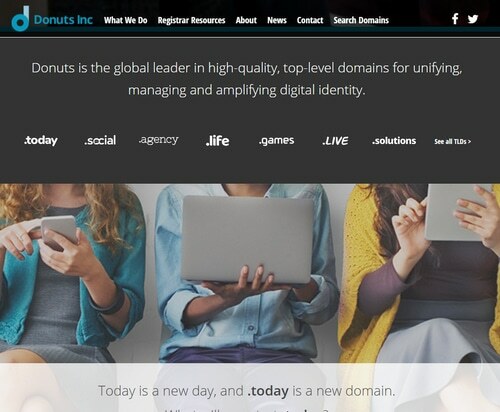 Donuts has updated its website after acquiring Rightside (it looks like they mostly ported Rightside’s site), and there are a couple interesting things to note. First of all, Matt Overman and Matt Delgado have made the move to Donuts. Overman is the Senior Vice President of Sales and Delgado is Executive Vice President of Registrar. These are the only two execs from Rightside that I recognize on Donuts’ Executive Team page. Second, the headquarters address for Donuts is now Rightside’s old office in Kirkland rather than Donuts’ office in Bellevue. This makes sense given that Rightside’s office was much larger. Former NameJet GM gets a promotion and Dwayne Walker jumps from Oversee.net to Rightside. Matt Overman, formerly General Manager of NameJet, has a new role at Rightside. According to Rightside’s Executive Leadership page, Overman is now VP & GM, Aftermarket and Premium Domains. His bio describes his responsibilities as covering the “monetization and premium domain sales business”. In another domain name industry executive move, Dwayne Walker has joined Rightside as SVP of Business Development. Walker previously headed up business development for DomainSponsor, which was part of Oversee.net. Walker remained with Oversee.net when the parking company was sold to Rook Media in April. According to Walker’s LinkedIn profile, he joined Rightside in June. I’m not aware of any public announcement about it, and he just recently updated his LinkedIn profile. It’s an exciting week ahead for Rightside. It will officially be its own separate company, no longer part of Demand Media, and will begin trading on the NASDAQ as NAME on Monday. Photo: Matt Overman (left) and Dwayne Walker (right). Photos from Rightside.co.